Who was dad’s idol? The one and only Ashok Kumar—his co-actor in most of his films. 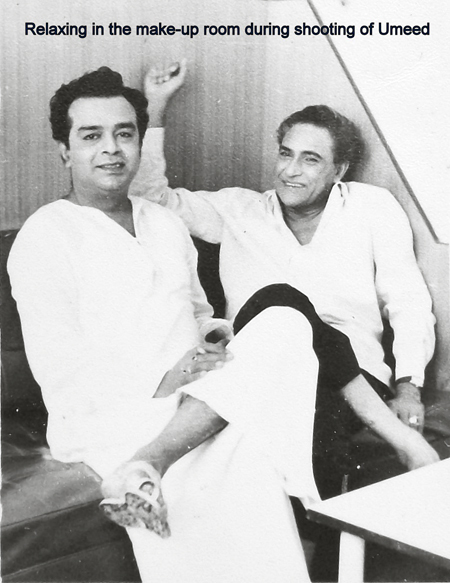 He held Ashok Kumar in high esteem long before he became a film actor himself. Dad was thrilled when he was introduced to Ashok Kumar. He came home and told mum—much like a star struck teenager—“You know who I met today?—Ashok Kumar”. So what was it about Ashok Kumar he liked the most? 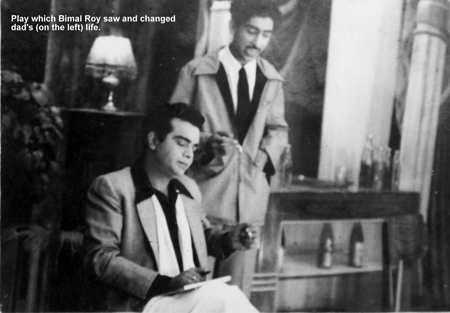 It was Ashok Kumar’s insistence on working towards the betterment of the scene and the film as a whole. He always focused on the scene and not just his own performance. He neither worried about his co-actor stealing the scene nor was he intent on doing so himself. 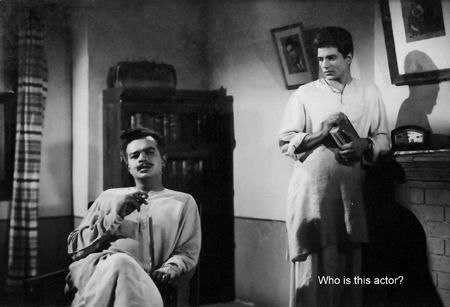 Ashok Kumar went beyond the script and improvised a lot, often discussing the scene with his co-actors. If I were asked to choose one film featuring the two of them (dad and Ashok Kumar) I would unhesitatingly choose “Oonche Log”. I rate their scenes together in this film very highly. Sometimes however, a sudden improvisation by a co-actor can put an actor in a spot. My father found himself in such a spot during the making of “Farrar”. Like “Kohraa” and “Bees Saal Baad”, “Farrar” was also produced by music director Hemant Kumar. A not-so-interesting suspense thriller, it had a new lead pair in Anil Chatterjee and Shabnam. While Shabnam was earlier seen in supporting roles in Hindi films, Anil Chatterjee was a well known name in Bengali cinema. 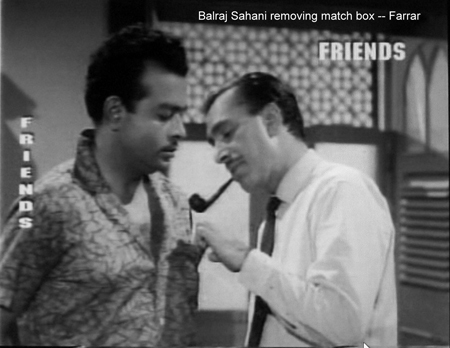 In “Farrar” dad was a villain named Shyam and Balraj Sahani was a detective. There was a scene were Sahani interrogates dad. According to the script, the detective—during the interrogation—-was supposed to show a cigarette lighter to Shyam and say, “This is your lighter, it has the letter ‘S’ engraved on it.” Shyam, denying that it was his lighter, was supposed to take out a match box from his pocket and say, “I always use a match box.” During the actual take Sahani suddenly decided to go beyond the script and very casually removed the match box from dad’s pocket and lit his pipe and kept it aside. Dad was a little taken aback but he recovered quickly. When Sahani questioned him about the lighter dad looked at his empty pocket with a confused expression and said, “I always use a match box” and then looked up with a smile on his face and said, “But you took my match box.” Thus a humdrum interrogation scene became a little interesting although the two of them hadn’t discussed the subsequent improvisation. I guess it helped that both of them were stage actors. If I were asked to choose some of my favourite films from the approximate fifty odd films that he acted in, I would prefer to talk about the role and more specifically some scenes. Films like “Sujata”, “Anupama” and “Gumnaam” are very popular and therefore discussed and written about; but there are many films which were not so successful and some successful but lost in the passage of time. Though there are many such scenes for the moment I would like to touch upon four films. To begin with there was the siver jubilee hit “Aan Milo Sajna” featuring the then reigning superstar Rajesh Khanna and Asha Parekh. I saw a different dad in this film. He played Asha Parekh’s father. Though he had the usual serious scenes, there were some scenes with some light-hearted banter between dad and Asha Parekh, and also between dad and Rajesh Khanna which I liked very much. He refers to his daughter’s lover—Rajesh—as ‘Something Something’—this dialogue became quite popular and after the film’s release wherever he went people would say, “Hey see ‘Something Something’ is going”. My mother says dad liked to play such roles—roles with both a touch of seriousness as well as light heartedness—seriocomic roles. Incidentally, “Aan Milo Sajna” was directed by the late Mukul Dutt, a successful lyrics writer in Bengali cinema. He was married to actress Chand Usmani. Another film and another scene, well this is with a very talented newcomer with whom dad was quite impressed and who was not so BIG then, it was pre-“Zanjeer” after all; I am referring to the Big B—Amitabh Bachchan. 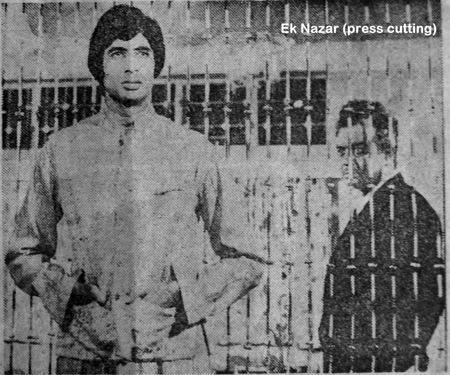 The film was “Ek Nazar” and the scene was a confrontation scene between father (my father) and son (Amitabh Bachchan). Their interaction in this scene has been embedded in my memory. 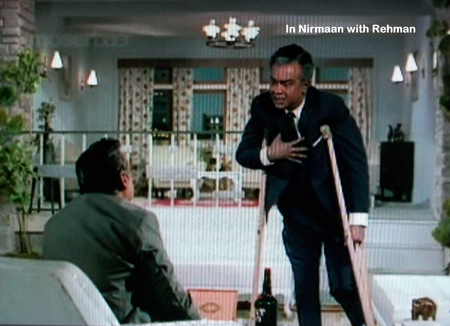 “Nirmaan”, directed by Ravi Tandon (Raveena Tandon’s father), is another film which is etched in my memory—no not the film as a whole, but this particular scene between Rehman and dad. I rate this as one of dad’s finest performances. He very effectively brought out the sense of shock at having been betrayed by his trusted friend Rehman. Interestingly as I was going through the film I noticed Veeru Devgan’s name—Ajay Devgan’s father—in the credits under the title fight composition. This in turn reminded me of the compliment that fight composer Shetty paid dad. He told dad, “You do your fight scenes pretty well, I will compose a wonderful fight scene for you.” However that was not to be. 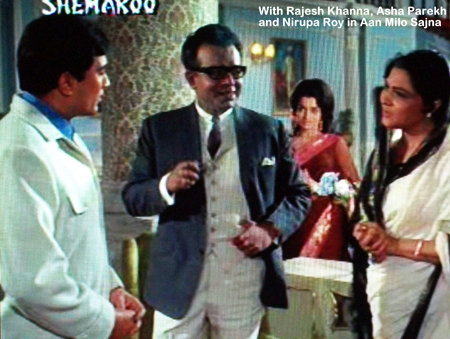 In the sixties around the same time as “Anupama” and “Gumnaam” dad was also doing “Devar” (directed by Mohan Sehgal). Interestingly “Anupama” and “Devar” more or less had the same cast: Dharmendra, Sharmila Tagore, Shashikala, Deven Verma, Durga Khote and my father were common to both films. It was based on a Bengali novel ‘Naa’. However the film departed a great deal from the novel. My father, who played Sharmila Tagore’s brother in the film, had to deliver a rather long dialogue in a scene with Dharmendra. It was a monologue and I found his dialogue delivery excellent with all the right intonations. My mum says he used to rehearse the dialogues at home. He indeed worked quite hard because for him it was a labour of love. This is exemplified by what a journalist (Lachiram Choudhary) wrote about him in the Hindi film magazine Madhuri soon after dad passed away. Choudhary, from what he writes, apparently knew dad from his Nagpur days. 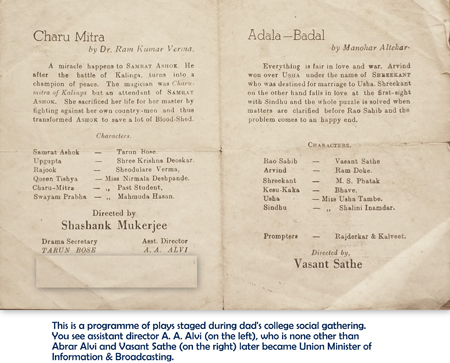 He wrote about dad’s devotion to his work and gave the following example: All India Radio was to broadcast a play ‘Narmada’—this was while he was still in Nagpur—the play was a 100 minute play in which dad was doing a cameo, rehearsals for the play were going on for fifteen days and Choudhary writes that although dad’s role was small he took a 15-day leave from work to rehearse for the play. Yes indeed to the casual onlooker it would be deep devotion to his craft, but my mum says that he definitely did not enjoy his clerical job; it was just a means to an end. Therefore if he was given a choice of rehearsing for a play or going to the office, obviously the rehearsals won hands down. Through Choudhary’s tribute to dad I was able to get an idea of how much people who came in touch with him loved him. He wrote (since I am translating from Hindi some of the emotion maybe lost in translation) that he (Choudhary) had got a break in a radio play. Plays in those days were not recorded but broadcast live. Since this was Choudhary’s first play he was nervous, he writes—‘the moment it was my turn to deliver the dialogue my hand which was holding the script began to shake. Suddenly I felt a hand on my shoulder; the touch was soothing and encouraging. I can still feel the warmth and affection of that touch.’ Choudhary was obviously referring to dad’s touch. I too have memories of how dad was eager to help anybody and everybody—be it a person looking for a break in the industry or someone in need of financial help he was always ready to help; it was a different matter however that he sometimes got taken for a ride. My mother points out that there is nothing extraordinary about this as many people help the less fortunate, but what is commendable is what he did as a newcomer. He had just come to Bombay and had begun work on “Apradhi Kaun.” He was travelling by bus when the bus met with an accident. My father noticed that the fault lay not with the bus driver but with the driver of the car which had come in its way, and to further add insult to injury the car driver was berating the bus driver. Seeing this injustice dad decided to testify in favour of the bus driver. The other passengers advised my father against doing so and getting trapped into making the rounds of the police station and probably the courts. He ignored their advice and saved the bus driver from losing his job. The bus driver was overwhelmed. Some memories indeed are enduring and sweet; my brother for instance continues to recall his visit to the sets of “Kohraa” (dad wanted him to see the scene where the car drowns) and the Sheesh Mahal set of “Mughal-E-Azam”. The Sheesh Mahal set was thrown open to the public—for a price of course, you had to purchase a ticket—after the film’s completion. Besides being a good listener, dad also explained things very well; I think he would have been a good teacher. If I have developed any writing skills, it is thanks to him for when it came to writing essays in English I always rushed to dad. As a child I noticed dad never avoided answering any question and here I would like to share something: I had just seen dad whip Rajendra Kumar black and blue in “Ganwaar”, and I wanted to know whether Rajendra Kumar was hurt. Dad took out his belt and said, “No he was not hurt, I will show you how I did it.” Seeing me a little nervous he assured me, “Don’t worry my child nothing will happen to you.” True, when he struck me with the belt it felt like the touch of a feather. He said that care should be taken to see that the tip of the whip or the belt does not touch the body; it is the tip which hurts. Dad was a foodie. He loved to experiment with food and my mum, who is a passionate cook, fully supported him. But I know for sure that he did not experiment with one dish which was suggested to him by Sanjeev Kumar, who used to squeeze lime juice on his omelet and once asked dad to try it out, “It tastes real good,” he said. I wonder whether he was right? In the short time which dad had in this world he acted on stage (he also directed plays), radio, films as well as television. 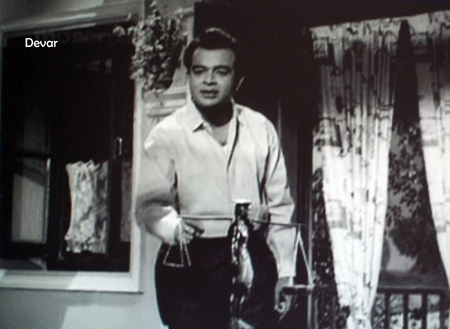 Although he was looking forward to watching his films on TV, he was denied that pleasure for TV came to the city few months after he passed away; but he had the pleasure of acting in the American TV serial Maya, which featured among others Sajid Khan—seen as a child actor in Mehboob Khan’s “Son of India” and “Mother India”. Dad garnered a lot of goodwill in the industry, which was reflected in the large turnout on his sudden departure. It was definitely a painless and not a lonely exit from this world. Almost everybody from all sections of the industry—a veritable Who’s Who of the industry—descended on our home. Those who could not make it that day came subsequently, but my mother was deeply touched particularly by Balraj Sahani’s gesture. Although Sahani had suddenly lost his daughter (dad was planning to pay him a condolence visit on the day he passed away) and was yet to come to terms with his own loss, he took the trouble of penning a beautifully worded note addressed to my mother and having it hand-delivered to our residence instead of by post. As I end this post I have to say that, thanks to Memsaabstory I was able to pay this tribute to dad so close to his 82nd birth anniversary and it was a real pleasure interacting with each one of you who commented on my posts. As I wind up I am reminded of what Harindranath Chattopadhya once told dad. He and dad were chatting and as dad took his leave saying, “Ok Harinda we will meet again,” Harinda replied with a straight face, “If you are a non-vegetarian we will ‘meat’ and if you are a vegetarian we will vegetate,” and walked away leaving dad in splits. So till we ‘meat’ again on memsaabstory let us not vegetate! Here is a puzzle to keep those brain cells ticking. Who is dad’s co-actor in this photo? I have a feeling it should not be so difficult for you Hindi film buffs. Posted on September 1, 2010 at 4:01 pm in Hindi movies	| RSS feed You can skip to the end and leave a reply. I just don’t even know how to thank Shilpi for sharing these memories with us of her father and his career. I’ve told her that the door is always open if she thinks of more things she would like to share! Bless you Shilpi, and I hope that writing these posts has given you the same pleasure it has given all of us. I will cherish every glimpse I get onscreen of your father from now on! :) Whatta man! Did it give me pleasure? Well I cannot begin to explain how infinitely satisfying it was, I feel a sense of emptiness now. Thanks for including the Apradhi Kaun screen cap, I was planning to but hesitated for I had already included so many photos. I just happened to have it lying around (seriously!) :) And anytime you feel like sharing more, you are welcome to. I had serious questions about the ending in Bandini, will wiat for your review memsaab to see if you have the same views! Wow Shilpi.. I’ve read all your posts with deep reverence. Thanks for sharing everything..and hopefully we’ll get all these (and more) in the form of a book someday! Thanks again for taking out your time. ps: Is that a veryyyyyy young Dharmendra? I have no words to describe this. Any adjective I think of only seems inadequate. Cannot thank you enough, Shilpi, for sharing all these memories with us. Each of these posts was a truly delightful read and today’s is the culmination of them all. We can all sense the emotion that has, understandably, gone into your writing about your dad. It is clear that he was not just a fantastic actor but also a really wonderful person. It is absolutely no wonder that so many people came to give him their final respects. Words rarely fail me but at this moment I am struggling to find the right words to express my feelings about your dad and your writing. He will always have a very special place in our hearts, that’s for sure! May God bless you and everybody in your family! Please thank others in your family too on behalf of all of us – I am sure they have all given you their share of memories to share with us. And yes, if there is more that you want to share, we would LOVE to hear from you. You are welcome Raja, most of what I shared were what my mother and brother told me. I was very young when he passed away. Thank you so much, Shilpi for sharing your father with us. Your memories and insights into the man and his career are beautiful and touching. I have gained so much from reading your posts and I hope that you will continue to share with us. He was obviously a very special person in addition to being such a talented actor. I really can’t express just how much I have enjoyed this glimpse into history. It has brought to me a vivid picture of a world with which I was not familiar and now want to know much more about! This is Fantastic Rita!!! You show have great talent & keep so many many people going by giving them great pleasure & I Love You for this!!! Keep up the good Work eh!!! Overwhelming! I wish more people would come out with such memories. Shilpi, you should write a book. I’m really hoping that somebody in publishing will stumble across these posts and realize that there is so much more to mine there too, and take advantage of Shilpi’s talent for writing and insight! You could easily write a book Memsaab. How about one on Ted Lyons? I meant “mine” as in dig out, not “mine” as in the personal pronoun…just reading my reply I realize that’s not clear. Oh these shy artists! They deprive us so! A very fabulous post, Shilpi. The actor is as identified by so many before me – Dharmendra. He’s another actor with whom your father might have acted in so many movies. I don’t know which movie does this screencap belong to. Is it Soorat Aur Seerat (1962) by any chance? 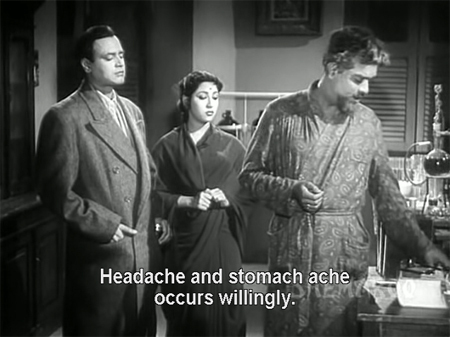 The film is Bimal Roy’s Bandini. Fantastic. This post is brimming with information that is not available elsewhere. Like all others, I enjoyed reading about Tarun Bose with great interest. What wonderful memories. It was so nice knowing abot him. I hope we will get more more glimpses of him in future as and when you remember some more information. Thanks a lot for sharing such wonderful information with us, Shilpi. Thank you, Shilpi for sharing such fascinating anecdotes about your father. They brought a time alive. What a special person he must have been! And thanks, Memsaab, for making this happen. Long live memories of Dada and all g8s from his era,Shilpi you just induced new life into this g8 performer and all others yu mentioned had association with him, I cud make a guess ( I had mentioned in this Blog we wud love to hear more on Dada Moni since he did a lot of movies with him), and so glad to hear Dada Moni was his idol, along with Abhida and another g8 performer Harinda (Tere Ghar Ke Samne, Aashirwad, Teen Deviyan….). Super and rare insight, def will cherish these. Thx a lot for your time and effort. or .. er….. earlier one Bandini (1963)… I wil go for this one ‘cos Paajee is much younger here ???? p.s. look fwd to seeing Nirmaan, not seen b4, as was out travelling, but a VCD was found. All the best to yu and family. Thank you everyone, for the wonderful response, wish each one of you and of course Memsaab all the best in life. Hey Shilpi, maybe you could write up interesting incidents of your dad’s movies. For ex: you could possibly take up one movie in each post and write more details of what happened during the movie shooting. I am sure all of us will agree. I just can’t seem to imagine that the series finished so quickly. All Others – Please revert. Shashi I am planning to put up his website, not now sometime in the near future and in the website which I guess will be more like a blog I will take up each of his films. But before that I am on a collection drive I am searching all the shops for DVDs and VCDs of his films. Thank God some of his films are available online. That is a fantastic idea, Shilpi!!! And who better to put up the website than his own family? The posts that you have written here have already endeared him to many. I am sure the website will be a fitting tribute to his memory and will allow him to be remembered by a larger group of people. Btw, I just searched for him on wikipedia and this is what I came up with. Just 3 sentences!!! I am shocked. So that website (or blog) cannot come soon enough. In the meantime, somebody needs to update the wiki entry. I had already seen the wiki entry and I see that someone has already updated it yesterday well thanks to whoever it was. That was me Shilpi. I just happened to add the dates over there. Didn’t find time to add anything more and secondly I thought it will be more appropriate for his daughter to update that. You could possibly add the website that you plan to dedicate to your father over there. A very good idea, Shilpi. 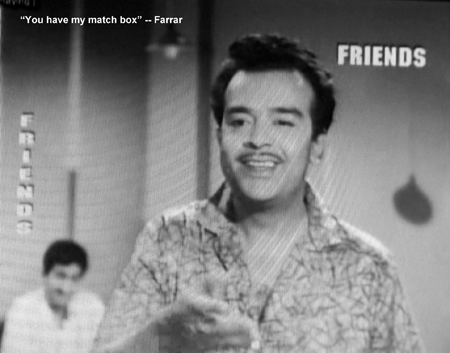 I have two of his movies on VCD – Bandini (1963) and Chand Aur Suraj (1965). Not sure if you have both of these. Bandini is I think is available at the store nearby,the rains have given some respite so will be able to run across and get it and am told Chand Aur Suraj is available in an online store. Hey thanks Shashi for the update. Oh so I can add the website there is that so? that will be nice. @Shilpi – yes, you can very much update the site. Just click on the ‘Edit’ link there and the page is all yours. One thing to add is that wikipedia takes pains to ensure that information added to a page is verified from another source, So you may need to add these references to the page. If there is no evidence provided, then the entry will be removed. Thank you for this excellent series Shilpi! I enjoyed each and every one of these posts. And thanks Memsaab for making it happen! And that has to be Dharmendra. Aww. Lookit! Thank you, Shilpi for sharing all these memories with us. The entire series has been very fascinating. Sometime back I had a little e-mail chat with your brother Aroop. He certainly remembers his Sheesh Mahal visit. And thank you, Memsaab, for providing such a wonderful space. I loved reading all the parts especially this last one with so much real life information. Thanks a lot Shilpi. The bus driver incident is very touching. It’s interesting that the scene you mentioned in Ek Nazar is exactly the one I thought was great too. I watched this film recently and it is fresh in my mind. Watching films with your dad in will have an added dimension to it from now on. Shilpa, I can only say “THANKS” for sharing your stories for which I am deeply grateful. Your father was in one of the very first Bollywood films I ever saw (GUMNAAM), and it is so wonderful to know more about the man. It will make watching his films just that much more enjoyable. Thank you, thank you, thank you. And I hope that if any other recollections of your dad, or your own experiences with Bollywood, pop into your mind, that you will share them with us! Yes I have few more memories which I missed out but no problem, since they are related to his films I will share them as and when Memsaab does a review. She has for instance promised to do a review on Bandini, I have something to share about that one; I forgot to put it in his biography. Yes I do have something but this late will anyone read it? Oh well I will add it there. In fact, I did post a comment on the Gumnaam post a few days back. I was wondering how Shilpi didn’t add a comment to that movie. Thank you Shilpi for sharing your valuable memories with us. Shilpi, thank you so much for sharing and feelings flowed from when reading. A great series of posts with the last one being my favorite. Memsaab, thank you for making this happen. I really have no words for you, Shilpi other than “Thank you” from the bottom of my heart. You’ve given us so much, I wish I could share something with you. If there’s a particular movie of your Dad (like “Anokha Daan”) that you’d like to see, let me know…I’d be more than happy to share what I have. Very kind of you Shalini I will let you know at the appropriate time, you see from my father I am moving to my mother the passionate cook, I have started a food blog which is dedicated to her recipes, it is still in its beta phase and needs some fine tuning. Once I am done with that I will move to dad’s website. Shilpi, many thanks for this delightful series on your father. And thank you Memsaab for making it happen. Thanks Shilpi. Others got there before me but Dharmendra from the forehead alone. The best is always the last – this is the most emotional of the series and I thoroughly enjoyed reading. I am now planning to re-watch the 2 movies with Tarun Bose that I own – Gumnaam and Sujata. Thanks Shilpi for giving us all such wonderful glimpses of your father’s life and character. P.S. the print was kinda shaky and hopping but at least we have a copy until we see a better one. Sorry Ash missed this comment. Actually the entire film has dad’s voice, it is only towards the end where he is laid up on the bed all in bandages and in another scene before this one where he is shown back to camera, in both these scenes it is not dad since these were shot after he passed away and obviously the voice was dubbed. His role was rather a good one unfortunately he was unable to complete the film. I know I’m coming late to this post, but Dustedoff sent me to this series today. And I read every single one of them, one after the other. Not only is it about one of my favourite actors, it gives me a glimpse into the man he was. Thank you so much, Shilpi, for sharing him with us, and thanks memsaab for hosting this post. Like many others must surely have said before me, Shilpi, I wish you would collate all your memories about your father into a book. There is a treasury of stories waiting to be unearthed, and it’s a shame that we have no written record of those golden years of the film industry. Thanks once again! Sadly there don’t seem to be any publishers who think a Tarun Bose biography would sell—shows how much THEY know! But I know Shilpi is planning to start a new blog where she can continue to share her memories of her dad, and you can be sure I will post a link to it when she does! I read all those post word by word and would like to thank Shilpi for sharing her and family’s memories about a very fine and dedicated artist of hindi Films. Memsaab,do you realise that you are doing a great service to the old film lovers and more than anything your act of featuring such memories is a solid contribution to recording History of Hindi Films. ? Unlike western countries,unfortunately,our Film Industry is eminently a failure in chronicling events or recording informations on Artists or films.Thus you dont find information on hundreds of films,and hundreds of Artists are unknown to this generation. Whatever information is available today about the old films and Music,is thanks to the untiring efforts of lovers of Hindi films and Music.Such persons are also few and not very wellknown beyond a perticular circle. Further,sharing knowledge and leaving it recorded for future generations has never been the strong points of Indians.The position is so pathetic that even the complete list of Credits of ANY film is not available ,thereby making it extremely difficult to identify actors from old films(even new films).I would say,even in this field,Memsaab,you are doing a great service to the industry and lovers of OHF( old Hindi films) by regulary discussing the identification. The many(infact too many) Film sites on the Internet are so useless that it is better not to believe them.One site gets information(or guesses it,may be) and the rest simply and blindly copy the info.Thus wrong informations are spread faithfully.Most of the sites do not provide all info that they promise and none check the authenticity of what is given. My thanks to you that in whatever possible way at least you are giving right informations which come out of the discussions in your blog. May your tribe grow ! I’m glad to be included in the circle and so happy that you come here and are adding to the conversation! Thanks Shilpi (and Memsaab) for this extra special feature. Your father’s interaction with each of these personalities makes for very interesting reading. It seems somehow fitting that Dadamoni was his idol. Incidentally, Dadamoni is being remembered this week on account of his 100th birth anniversary. He seems to have touched the hearts of so many people. Thank you very very much Arun, Anu and Faldo. Anu I would love to write a book but publishers do not encourage ordinary bloggers like moi so I have set my heart on a blog dedicated to dad and maybe I could also discuss the cinema of the period. The encouraging response by all of you has spurred me on. hi..! your father had a nick name ‘Jandel’. the name was given by a nepali guard at your father’s maternal uncle’s house, where he was born. your father’s father used to work in bombay-nagpur railway and was a good football player. your father was first picked by bimal roy after he saw your father at a stage play. your father’s father was fond of ‘litchi serbet’. after your father’s premature demise your father’s father and father’s mother came back to the birthplace of your father. the room where your father was born, still exists. Thanks once again Ash by the way I finally saw Ma Beta, it is available online, but I think some portions are missing, for dad commits suicide but I did not quite understand why, obviously a chunk is missing, the quality of the video is quite good. Thanks for the info Ash, my only problem I have not been able to lay my hands on a Maa Beta VCD. Dunno if this is in the version u saw Shilpi ?? Thanks a million for this info Ash. No I did not see how he went mad. Part one of the online video ends with dad and Nirupa Roy deciding to start a business and part 2 begins with dad and Nirupa Roy up in hills with Nirupa Roy singing a song. I do not think there were any more cuts. Yes I did see till the end and yes you are right it is a little difficult to recognise him with his beard. Thanks once again Ash. Thanks Aparna. Where did you read that my mum was an actress? No she was not. The lady acting as dad’s wife in Anupama is Surekha Pandit. Yes I too would love to lay my hands on this film, ash I am at the moment working on a blog which will be about dad, his films and cinema in general, I have already drafted two posts, I plan to discuss his films in that blog.He played the role of an alchoholic, who drives his wife (Nirupa Roy) crazy with his drunken ways, fed-up she throws him out of the house. Here is a link to a song from the film after he is on the streets. Satyen Bose initially shot this song, (much against dad’s wishes) with dad lip-synching to the song, dad was not happy after he saw the film’s trial and requested Satyenda to re-shoot the song with the song playing in the background. Thanks ash, I have just posted the ‘About’ page, you can have a look though it is not fully ready, just click on my name. I want to know whether tarun bose acted in film shree 420? where is surekha pandit( actress of Anupama) now ?